Taken from a 1948 program, the picture below was used as the template for the 1950 badge which depicts three time winner Mauri Rose looking around the windshield of his winning Blue Crown Spl.. It measures 1 2/3" x 1 1/6". 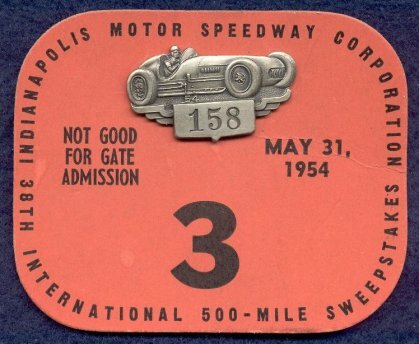 The 1951 badge measures 2 1/2" x 1" and depicts the famous Borg-Warner Trophy which has been presented to the winner in Victory Lane since 1936. By coincidence, the number on the badge is the same as the year. 1952 and 1956 are also this way. 1952 is a Firestone tire. Firestone had won 28 consecutive Indianapolis 500's by 1952 and had been in racing for many years. It measures 1 1/3" x 1 1/4". The "52" at lower right by the tire edge has been know to be mistaken as "32". The 1953 badge is a depiction of a helmet similar to that of a Cromwell which was a popular brand of helmet at the time. 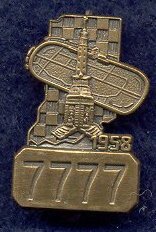 The 1999 badge is a fairly good representation of the 1953 badge. 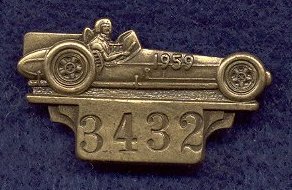 The days of the large badges was over as the 1953 badge is 1" x almost 2". To reflect the size change, the clasp and pin on the back of the badge is smaller as well. Note that IMS has been stamped on the back. The badge with no number is a proof or salesman sample. 1954 is the first "roadster" to win at Indy, the Fuel Injection Spl. driven by Bill Vukovich to victory in 1953 and again in 1954. The '54 badge comes in at 1 1/2" x 3/4". 1955 is a steering wheel similar to that on cars of the era. The 1955 measures 1" x 1 1/3"
1956 is the old wooden main gate which was located at 16th St. and Georgetown Rd.. *It was torn down after the 1956 race or in early 1957. The badge measures 1 1/3" x 3/4". For 1957 the "new" "Wing and Wheel" design which is the same basic design used on the program cover at that time. It measures 1 3/4" x 1 1/4". 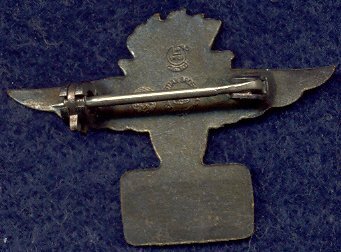 Due to the larger size, the clasp and pin are larger and sturdier like those from 1947-1952. 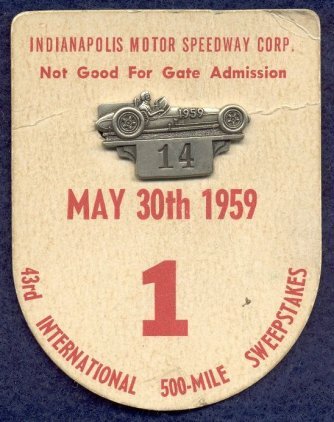 1958 badge depicts the Soldiers and Sailors Monument (located at the center of the circle in downtown Indianapolis) in front of an aerial view of the Speedway backed by a checkered state of Indiana. The 1958 badge is the smallest of the 1950's coming in at 2/3" x a little under 1". The clasp and pin revert back to the smaller size like that of 1953. Note one can see light blue where the badge was on the back up card below right which indicates it has faded. 1959 is the laydown roadster driven to victory by Sam Hanks in 1957 and Jimmy Bryan in 1958. Measurements are 2/3" x 1 1/3"
The 1950 through 1955 badges are the toughest of the 1950's to come by with the 1950 and '51 silvers the toughest.